This majestic home is located in Gateway National Recreation Area, a quiet corner of the Jersey shore, near the end of Sandy Hook. As it's 5 miles from the nearest commercial development of any kind, you will need a car to vacation here. Bicycling along the ocean is also a great way to get around! The closest towns of Sea Bright and Highlands feature attractions, restaurants, fuel, shopping and other convenience items. We're also not far from other popular destinations, such as Red Bank. Cell service is generally available through the major carriers. This is an historic home, so we're sorry, but it is not ADA accessible. NOTE: The rates listed below do not include the 6.625% NJ State Sales Tax or the 5% Short Term Rental Tax, both of which will be added to your stay at the time of payment. 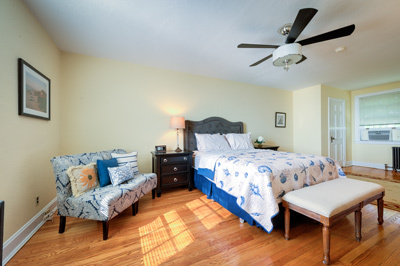 We're excited to have completed the renovations on our Fort Hancock vacation rental home, and we're gratified at the outpouring of interest. Please enter your contact information below to be kept informed of updates to the property. Thank you for your interest in this exciting project.